Mr. History Tourist is a rock hound. Nothing makes him happier than looking at interesting rocks. 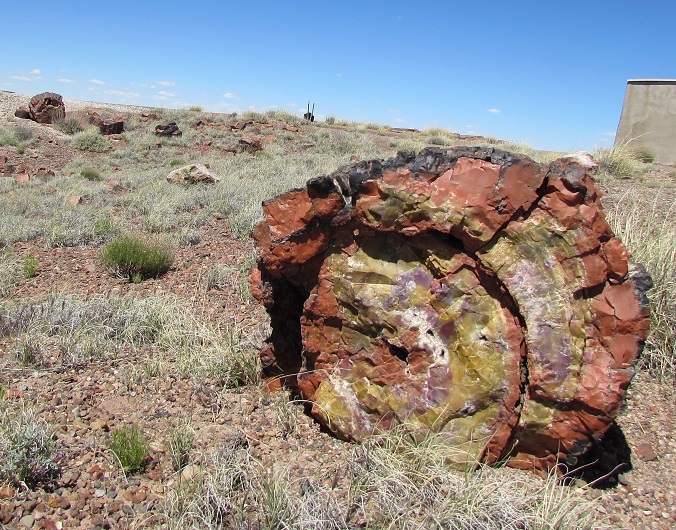 So earlier this week, we made a pilgrimage to the Petrified Forest, a national park full of the remnants of prehistoric forests turned petrified wood, fossils, and artifacts of the Native American civilizations that occupied the property. There are two visitor centers at the park, one on the south end and one on the north end, and each has a small museum. We started at the south end, where we met this guy. From the south-end visitor center there was a trail that took us to the Agate House, a little over a mile away. 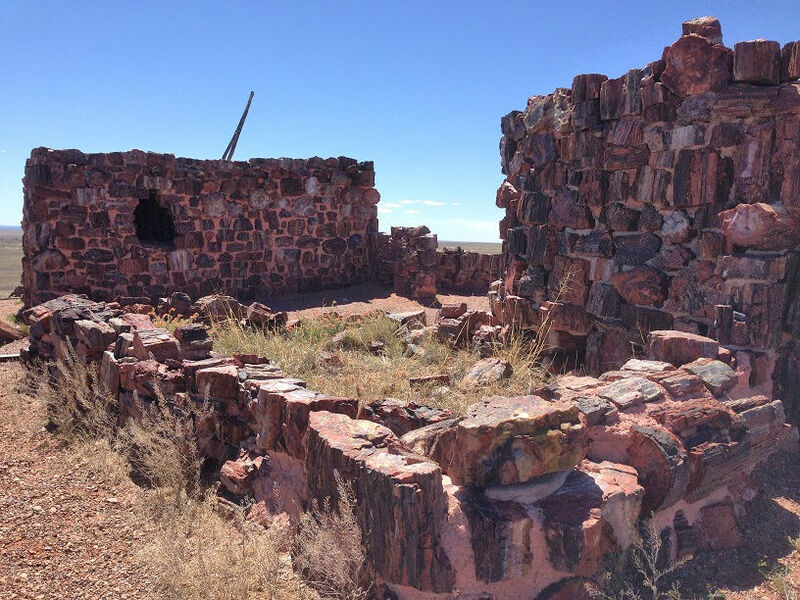 It was originally an eight room dwelling — part of a large agrarian community — built out of petrified wood by the Puebloan people and occupied between 1050 and 1300. It was excavated in the 1930s and a couple of the rooms were rebuilt by the Civilian Conservation Corps using the original materials. It’s 28-miles between the two visitor centers, connected by a road that cuts a north/south route through the middle of the park. Along the road is about 20 stops with various points-of-interest. We stopped at three of them: Crystal Forest, Agate Bridge, and Newspaper Rock. Other than the Crystal Forest, which was a one-mile loop around a boatload of petrified wood, the “sites” at those stops are just steps from the parking lot. Visitors barely have to get out of their cars to see them. My favorite of the stops was Newspaper Rock, which was actually a collection of rocks, displaying over 650 petroglyphs. 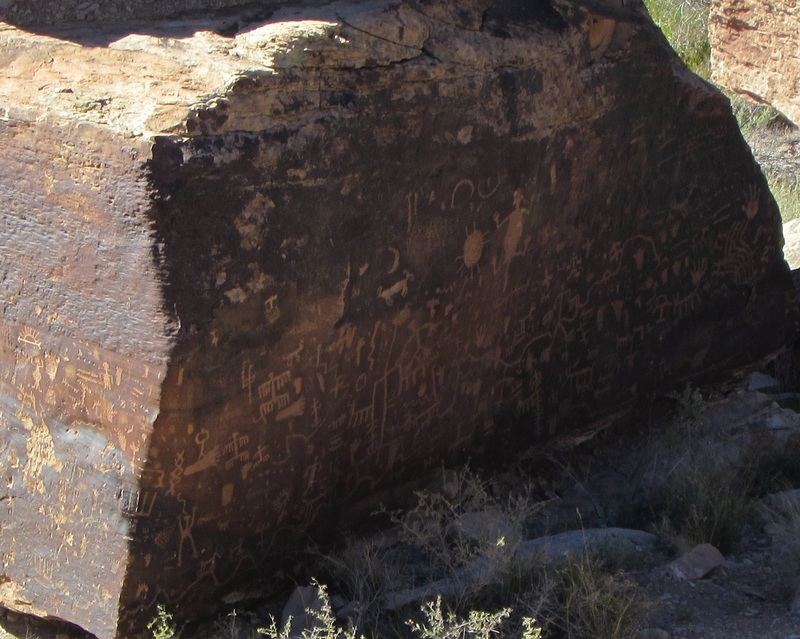 There’s no identifiable story to the markings as a group — they’d been drawn over hundreds of years, between 650 and 2000 years ago — but individually, they represent family and spiritual symbols, events and territory boundaries. We wanted to do some hiking, but there aren’t many marked trails. 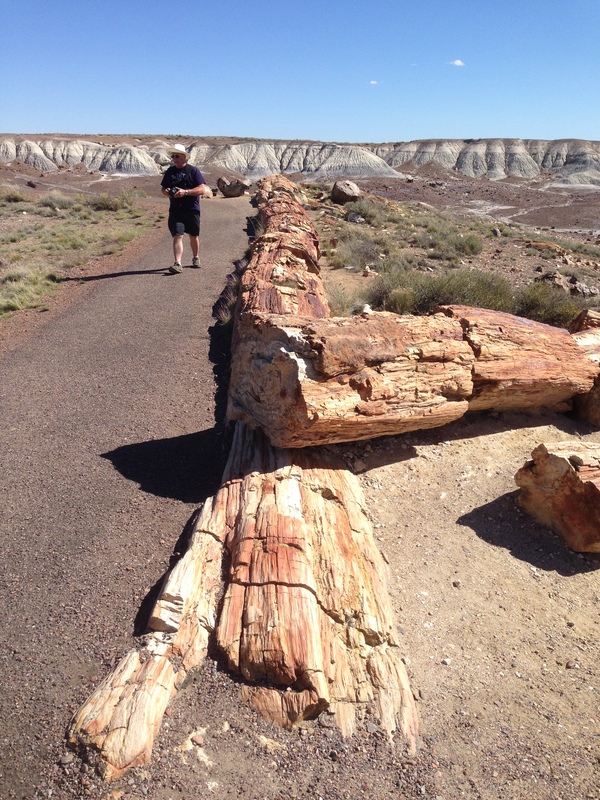 The Petrified Forest does have what they call their “off the beaten path” program, which provides maps and coordinates to popular sites accessed by unmarked routes. “Have you ever lost anyone, after they’d gone out wandering on their own?” I asked the person behind the information counter at the visitor center, after she suggested going off-path. “No,” she responded, looking a little surprised that I’d asked. Still, we weren’t brave enough to go off into the desert on our own. To do these hikes, the park service suggests bringing “navigation aids.” Also “navigation skills.” Mr. History Tourist and I have the opposite of “navigation skills.” So we satisfied ourselves with walking whatever marked path we could find and ended up with about four miles. If you know what you’re doing though, I imagine that a hike through the Petrified Forest would be an amazing experience. Approximately 12 tons of petrified wood goes missing from the park each year, and the National Park Service is rigorous in their efforts to stop the pilfering of wood and other artifacts. Entering the park, we were given a pamphlet urging us to record and report any incidence of rock or artifact stealing we saw. And leaving the park, signs warned that we should be prepared to be stopped and searched (we weren’t, though). There’s a minimum fine of $325 if you’re caught. And if that isn’t enough, there’s a slew of Native American curses linked to stealing petrified wood. The park gets several pounds of rocks returned each month, many with notes tying the theft to bad luck that followed. Gallery | This entry was posted in Arizona and tagged Agate House, metoposaur, Newspaper Rock. petroglyphs. Bookmark the permalink. I have got some bits of lava that I took home from Mount Vesuvius in 1976 and have always felt guilty about it! I got the feeling that there’d be a Native American curse associated with taking something from the forest. This sounds really cool – I’ve heard of petrified wood before, but I didn’t realize there was a national park devoted to it. Isn’t it unexpected? It’s not at all like the typical national park, like the Grand Canyon or the Shenandoah. But I can see why they’d want to provide the area with federal protection, and let people in to see it.